Seven years ago, when I purchased my first Eagle’s Nest Outfitters Hammock (ENO or Eagle’s Nest), I had no idea the jewel that I’d obtained. Over the course of the next few years, I didn’t really appreciate the hammock to the degree that I should have - as there was a certain ambiguity surrounding it because I didn’t know how to best hang it up or when to use it. I had little context for it..
Don’t get me wrong, I used it...but I abused it as well by not utilizing it like I should.. But by now, it’s beauty, I have discovered.. Following, I’ll describe the major attributes of/around the hammock explain it - so that others understand they’re worth purchasing, and don’t make the same mistake I did and have it but not use it..
Materials - the hammock is made of parachute material, so it is durable, smooth, breathable, and it packs incredibly small. So, I keep it in my car wherever I go. In regards to it’s durability, it is more so than any other hammock I’ve come across - particularly other parachute hammocks. It has triple stitched seams and has a durable cord attached to a solid caribiner for support. The smoothness and breathability comes into play when it is hot out - because the material does not easily stick to the skin (a feat in Florida humidity!). The breathability also allows the breeze to pass through easily, and even rain/water passes through with ease. In fact, some of my favorite moments in the hammock have come when I’ve been napping and a light mist is falling from the clouds..
Ease of Hanging - if you buy the Slap Straps from ENO, it’s extremely easy to hang up. You just wrap them around a tree - or other sturdy object - and clip the caribiner to the built-in loops on the straps. Personally, I like to use rope...because it allows me to make it as tight as I want...and I can string it up between two further objects. (Each of my ropes is 11’ long.) Additionally, it is important to note that you must tie a knot that will easily come out after you’ve weighted it (I use a bowline).. Accessories - There are numerous accessories from thick quilts, to storage, to lights. But the two most important accessories are the rain flys and the bug netting. 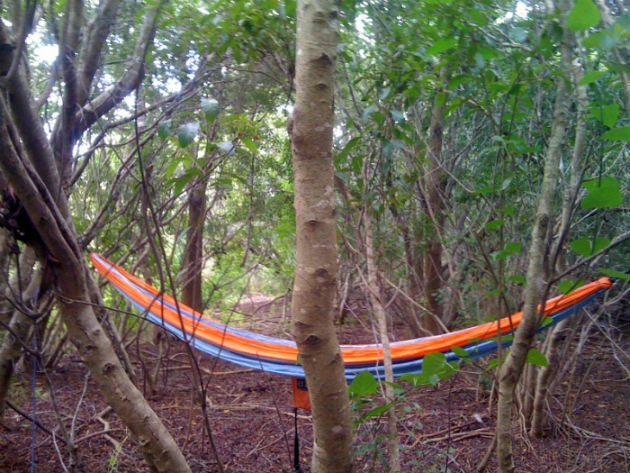 The rain flys are tarps that you tie off to trees above the hammock. The bug netting is a sleeve that slides around the hammock and you seal yourself in so no bug can connect with your skin. These are crucial for many hammock camping experiences, but I never use them when I’m simply setting up the hammock for a read or a nap.. I live in Central Florida - and have mapped out the local parks, springs, beaches, etc. 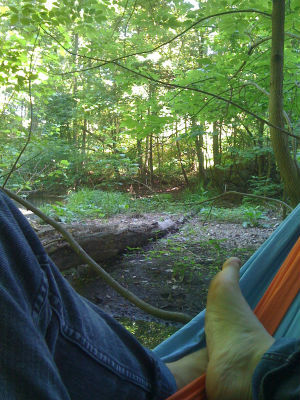 And though, in the past, I used to waste time...now, I’ll find one of these and string up my hammock for an afternoon read, or rest, or nap...and the calmness and tranquility of this cannot be calculated. Everyone should try this. It’s simply wonderful.